Ahoy! You’ve probably heard by now that it’s International Talk Like A Pirate Day! That right, today be th’ day t’ find your inner pillager. Talk Like a Pirate Day be conceived in 1995 by John Baur an’ Mark Summers while they were play’n racquetball in Albany, N.Y. (where I grew up!) an’ in th’ mist o’ their encouragement/trash talk they drifted into pirate slang. Arr, Baur an’ Summers were none t’ lustily good at racquetball an’ talk’n like a pirate made their game more enjoyable. Be’n “Get My Cat O’ Nine Tails!” a pirate isn’t unseaworthily easy work ye know. Pirates have a blastedly hard time find’n fresh squeezed orange juice which lead t’ a deficiency in vitamin C. No vitamin C causes diseases like scurvy which causes malaise an’ lethargy or crickets which causes blindness (that’s why ye always see pirates wear’n eye patches). Peg legs be also associated wi’ pirates which be probably cause one o’ th’ most famous pirates, Blackbeard, had a peg leg. Blackbeard lost his leg t’ diabetes. Too foul he didn’t have orange juice ’round t’ keep his blood sugar aloft. On “Gar, Where can I find a bottle o’rum?” ‘nother note, th’ phrase “shi’er me timbers” really means “shave me back”, so yeah, mull that o’er. 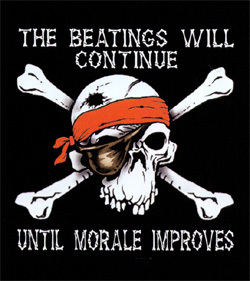 Today’s lesson is: talk like a pirate, but don’t drink like one, an’ shave your own back!